Home New York Giants What Would A QB Like Sam Darnold Bring To The New York Giants? The New York Giants and their fans have enjoyed over a decade of a quarterback that has been known as “immobile.” Eli Manning relies on his timing, accuracy and chemistry with players to make the most out of his abilities on the field. With the NFL draft coming up in about two weeks, the Giants have an extraordinary opportunity to draft their next quarterback, if they so choose. So, in this article we will be reviewing what USC signal caller Sam Darnold would bring to the Giants, and how he would differ from Manning. Darnold has been compared to quarterbacks like Brett Favre, Ryan Tannehill, Jared Goff, and Tony Romo. Most of these quarterbaks have had extreme success in their careers, but Darnold brings several interesting aspects to his game. The USC product has superb NFL size at 6-foot-3, 220-pounds, which helps his vision over the offensive line. His ability to look off safeties in coverage and find his target is one of his superior qualities. His release time and anticipation is at the professional level and would translate very well in the NFL. One of the factors that’s most comparable to Manning is his risk taking prowess. Darnold often makes risky throws, but they’re rarely wayward. Concerns over Darnold’s turnover ratio has been his most prominent weakness, so let’s take a look at his college stats compared to Manning’s side-by-side. When comparing the two quarterbacks, you can see that Darnold has more passing yards and completions than Manning, who also has three less interceptions. The biggest concern for Darnold is his fumble totals. But, an interesting fact here is that Darnold fumbled the ball 12 times over the course of 13 games. There’s no question that Darnold is a more mobile quarterback than Manning, which can attest to those totals. It's easy to see the intrigue with Sam Darnold. He has lots of traits to love about his game, but my favorite is his ability to make anticipatory throws. He sees things before they happen. This clip is extremely impressive from Darnold, as he looks off the safety in coverage and throws a pass from an awkward stance. His feet are facing towards the left of the field, while he throws to the right (on the money). That aspect of his game and vision is a very enticing factor for teams looking for an Aaron Rodgers, Brett Favre style quarterback. Take a look at this clip; Darnold steps up into the pocket and shows off his extreme athleticism by jumping above the offensive line and dumping off a perfect pass to his receiver in stride. This is the “risky” side of Darnold’s game, which can cause turnover problems in specific circumstances. The exciting part of his game is the ability to extend any given play and roll out of the pocket. His mobility to the outside and vision on the run is a great look and stock bumper for the USC quarterback. One of the main reasons for his fumble totals being so high is because he’s always looking downfield. He often ignores defenders at his heels in hopes of finding an open receiver, which often times leads to strip sacks. This can be fixed with a an influx of conservative playing at the QB position. One of the most comparable traits that Darnold and Manning possess is their extreme professionalism. 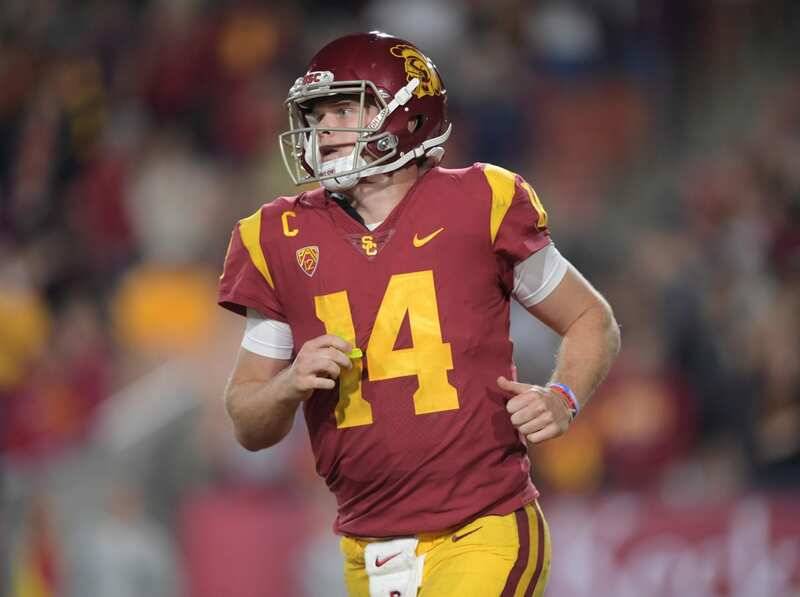 Darnold has a calm personality, similar to the two-time Super Bowl winning quarterback. This not only contributes to his professionalism, but it also aids his abilities in clutch moments. Overall, the Giants would benefit greatly from drafting Darnold with the No. 2 pick. Allowing him an additional year to learn behind Manning would be an ideal situation, but second-year quarterback Davis Webb remains in the wings. New York Yankees: Is Gleyber Torres Next Up? you seem to forget usc had an offensive line and d still had to roll out, eli wasn’t given a full o lin big difference to your critque. Have you ever considered Eli as a QB that can roll out while under pressure? Eli relies on timing with routes and often steps up in the pocket. The ONLY time he rolls out is when it’s a designed play action pass.